Legend has it that when Caesar’s general arrived on Portuguese soil in the first century CE, he claimed to have discovered a lovely country blessed with a mild climate and a beautiful coastline, but whose inhabitants were ungoverned and ungovernable. 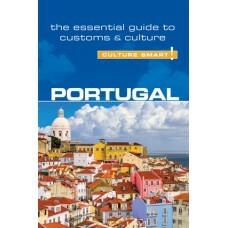 The Portuguese are still impulsive, set in their ways, and resistant to change, yet they are ever charming, romantic, and nostalgic, with an unshakable loyalty toward family and friends. Portugal is a land of contrasts and contradictions. Opulence dwells side by side with simplicity. Elegant homes nestle inside old, seemingly decrepit buildings. Lush green hills blend with jagged landscapes. The people themselves are colorful, diverse, and multifaceted. Culture Smart! Portugal takes you beneath the surface of this fascinating country and shows you how to blend in and make the most of your visit. In these pages, you will gain insight into Portuguese priorities and values and learn how to tap into a helpful and resourceful nature that is often overlooked by the casual visitor. In business and at home, the Portuguese are self-deprecating, fatalistic, and individualistic, in an unthreatening and even amusing way that can be both frustrating and enchanting. Beneath a rather vociferous manner, they are laid-back and gentle, so slacken your pace, put away your watch, and enjoy the rich meals, lively festivals, and ancient traditions of this great land!